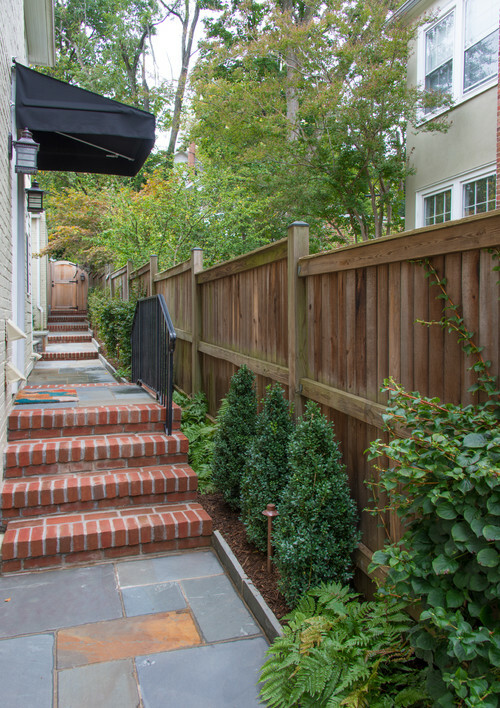 The owners of this house in Washington D.C. knew they could get more from their backyard. See how they multiplied their outdoor fun by turning their awkward sloped lot into a stylishly expanded entertainment patio, paths, terraces and even a basketball court for the kids. BEFORE: The existing patio between the house and the garage was not very inviting. 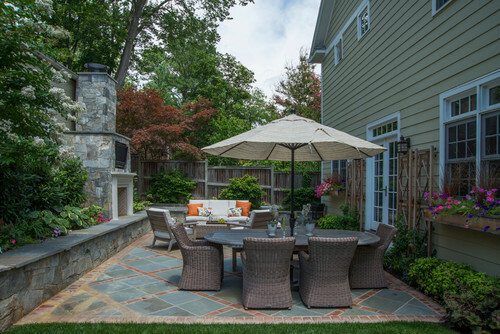 AFTER: Landscape architect Mark White graded most of the backyard into two levels and used the existing garage to create a courtyard. 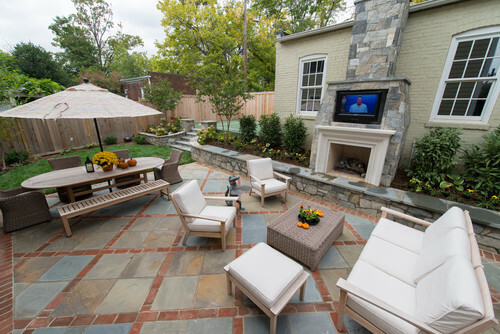 One level is now a 17-by-26 foot patio centered on a fireplace with an adjacent lawn area. Petunias in the window boxes add summer color. Evergreens provide a year-round backdrop, while annuals add seasonal color. “We maintained a green-and-white palette throughout. It’s clean and sophisticated, and plays off the off-white pillows and the limestone in the fireplace surround,” White says. 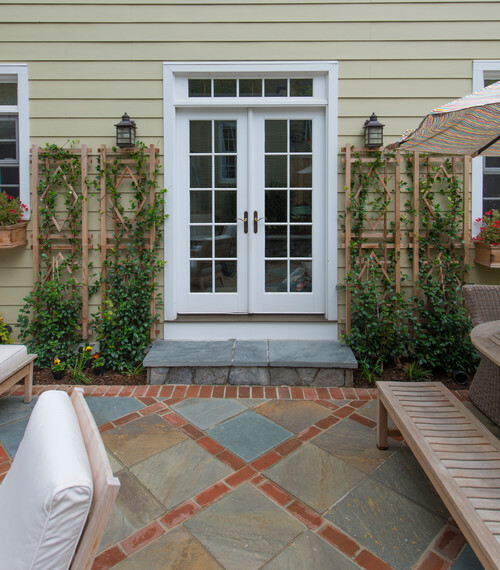 A diamond pattern of bluestone and crisscrossing rows of bricks gives the expansive patio interest and texture. The homeowners love to watch their beloved University of Florida Gators out here. (That explains the bow-tie-clad reptilian butler ready to serve drinks.) The retaining wall doubles as extra seating. A focal-point fireplace nestles between the garage’s two windows and integrates with the stone wall. Skip laurels next to the fireplace bring evergreen color to the setting. The stone on the chimney and wall is called Chocolate Gray, a locally quarried stone. The surround is Capstone, a concrete product with crushed limestone in it. Its lighter tone reinforces the fireplace as a focal point and complements the color of the house and garage. The stairs to the sports court help form a planting bed for ‘Little Lime’ hydrangeas and white-flowering crape myrtles, known for their sculptural trunks and colorful peeling bark. Other plants, such as ‘Paul’s Glory’ hosta, Soloman’s seal, white blooming liriope and creeping Jenny, add more green and white. The fencing is cedar. 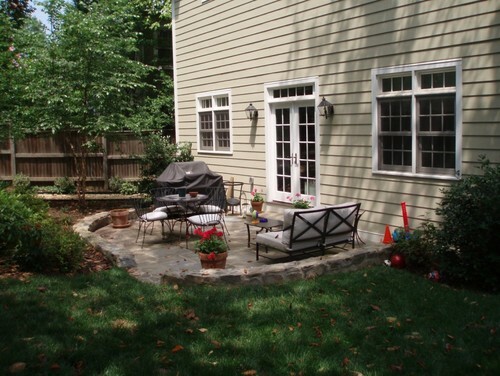 At the beginning of the planning stages, this area behind the garage was to be a second seating area and garden. As the design evolved, the owners decided to turn it into a place where their two boys could play. 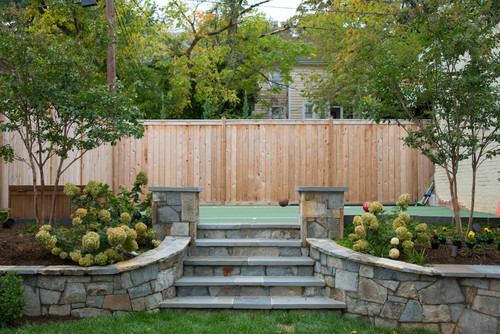 “The sports court is tucked away and integrated into the garden rather than being the focal point,” White says. The 20-by-26 foot court has a concrete foundation topped with flexible tiles, which provide a softer surface to cushion falls. Back on the first level, a French door leads to the family room-kitchen area. Because there was only a slip of a gardening space next to the foundation, White went up instead of out, using cedar trellises and window boxes to create room for more green. The plant growing up the trellises is star jasmine, an evergreen vine that greets everyone with its fragrance as they step outside. The stone staircase to the French doors is new, capped by Blue Select, the same flagstone used on the patio but in a more consistent color. The stones on the riser match the seating wall. White created a terraced path that extends from the front of the property to the back, with steps in coordinating flagstone and brick. “We decided to make this entrance a feature and dressed it up with an awning and lighting that matches the lighting in the back patio area,” he says. Along the fence he planted climbing hydrangeas, lady ferns and Buxus sempervirens (also known as Dee Runk), a boxwood that grows in a narrow form. The path continues past the garage to the back of the property.